Get a discount! For a limited period, the book is reduced from £16.01* to £12.99 from here (for UK. For RoW, see below). 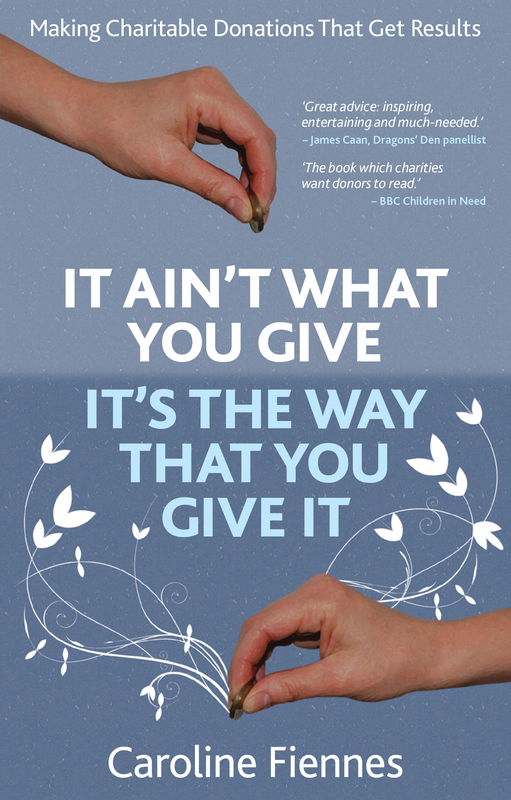 It Ain’t What You Give, It’s The Way That You Give It is a guide to charitable giving – explaining how charities work, and giving advice about how best you can work with them to improve the world. It’s “exclusively for everyone” – relevant to you, your children, your hedge-fund-manager friend, big foundations, and corporate giving. It includes advice on common situations: how to choose a charity to put in your Will; whether to give anonymously, what is an intelligent response to a ‘chugger’ in the street, to being asked for sponsorship, to a request from your school or university. What you need to know about charities. For example: why are there so many of them, what they do in relation to government, the various ways that they improve the world, and how to understand their impact. What to do if you’re giving a lot / as a family / in your company / as a foundation. For example, how to choose a focus area, how to get organised, the team you need, how to find a partner, how to track whether you’re being successful over time, and how to involve your colleagues. The calculations used in the book are detailed here. This is the Application form given in the book, which can be used by any donor. *Why the quirky price? It’s a nod to the Charitable Uses Act of 1601, which forms the basis of much charitable law in the UK and around the world. Orders will be dispatched on or around the launch date.